The Samsung DROID Charge is finally available at Verizon and in this article you can find out more about the second 4G phone from this carrier, after the HTC Thunderbolt 4G. Here are the best digital picture frames for under $100, the perfect gadget choice for the upcoming Mother’s Day. If you’re looking for a decent entry level phone that you can use for messaging and listening to music, this LG Cosmos VN250 phone might be the thing for you. Check out this short review to see if it’s what you need. A complete review for the eLocity A7 tablet, a 7 inch model aimed at smaller budgets that still want quality and a nice design from their tablet. 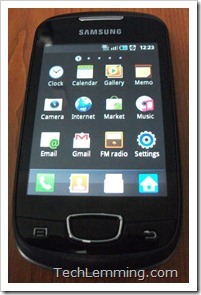 An extensive review of the Samsung Galaxy Mini S5570 mobile phone, a budget model that offers good connectivity options and Android 2.2 as the OS on it. Check out the article for the entire review. The HTC Merge is a QWERTY and touchscreen phone with a 3.8 inch screen, Android 2.2 and a camera with 5MP sensor. Read on to find out how the Intel Thunderbolt technology works and why it will prove to be revolutionary for the industry and the regular user as well.